The "stain glass"design is a wonderful choice for the background of the text. In the middle is the Artist's Alef Beth creation with the Chai in the middle. 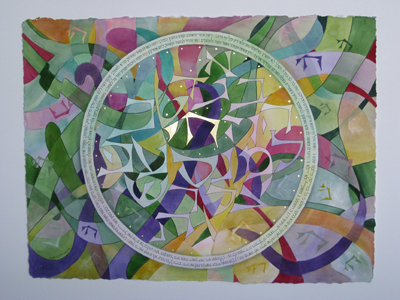 The text Eshet Chayil is written in a shape of a ring, a circle, that has no beginning and no end, symbolizing Eternity. The Chi motif is scattered throughout the artwork in negative and positive painting. Ink: Mixed Media with 23K Gold Leaf. Can be done as a Ketubah.